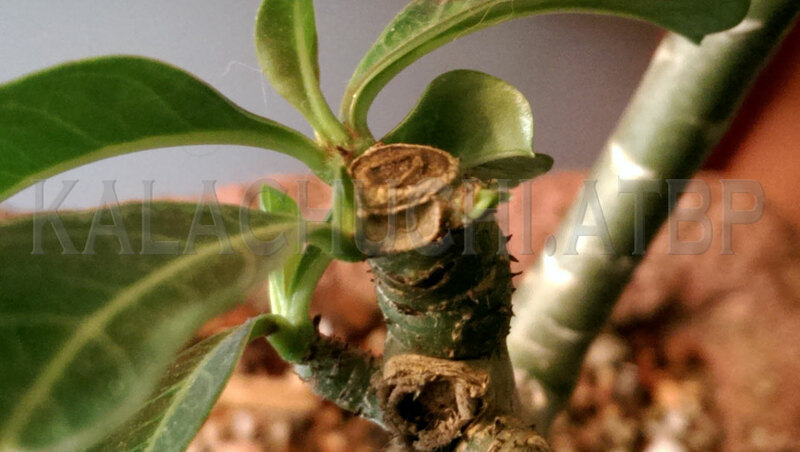 Yes, you can prune adenium seedlings as early as it starts to bug you. 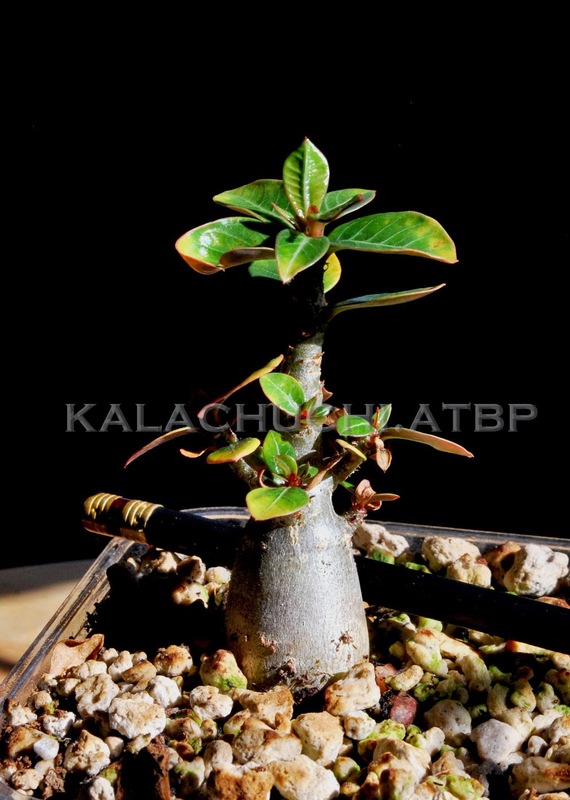 This adenium seedling, for example, was trimmed in winter--around February 2014. Months later, it was discovered thriving in the Precious Plant Unit, completely unrecognizable. I have no memory of which seedling this was, it looked so different. Where did it come from? How did it end up looking so nice, compact and ridiculously healthy-looking? It turns out, this seedling is one of mine. The Adenium Goddess (the one I just made up) did not, in fact, creep into the plant box and surreptitiously replaced the prima donna that used to be in that pot. Furthermore, this used to be the favorite seedling that was subsequently given up for stupid. If adeniums could be grown to about 2 feet with seven 2-foot long leaves, that would be fantastic. That cuteness happened on its own, too, with no special treatment whatsoever. As winter descended this particular seedling was given a prime spot in the Precious Plant Unit (PPU) where it got 14 hours of light. Then, for the first time since it was sown, this seedling became temperamental, as you can see in the photo on the left. The leaves started yellowing although they never really dropped, the trunk started getting longer--known in the highly technical horticultural circles as giraffing (smirk). It is probable that the thing was trying to drop into dormancy and just could not decide. At the time, the PPU's heat mat was off and although the residents got 14 hours of T5HO light every day, the temperature dropped to 16C at night and was never over 20C during the day. This seedling has never needed attention before and, so, didn't actually get any. The assumption being that it will resolve its angst in summer. As chance would have it, the PPU was needed for another project that required switching on the heat mat. So I decided to operate on this seedling since it was going to get heat all through winter anyway. It will recover quickly from whatever I do to it as long as it is summer in that box as far as all the plants in it are concerned. The first thing to do was to dig the thing out and give it a thorough check to see what was causing this ex-favorite to throw a hissy-fit. So! Little Miss Favorite here was de-potted, washed and all the annoying not-quite-yellowing-yellow leaves were removed. There were no visible pests on the plant or in the soil. A simple repotting might have sufficed but that shape is really annoying. Clearly, that ungainly top needed to be sliced off or it will not stop reaching for the sky. Now, if you have ever doubted the impulse to prune your young seedlings, the only thing you must remember is to provide adequate heat and ample light to help them recover faster. In the winter, this will take some doing (heat mat, bright fluorescent light); this is why most people prune their plants in late spring. But if you have those two things, you can prune your seedlings anytime, at any age. 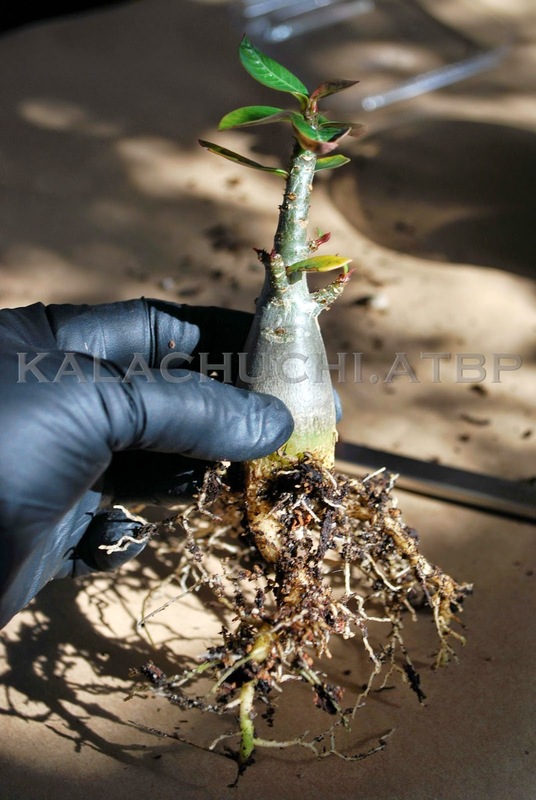 After being dug up, a cursory inspection of the roots showed that they are abundant, firm and healthy. There was no root pruning necessary so they were just rinsed with tepid water. Rooting hormone may be used but this one did not get any of it, only fresh potting material (one part potting soil and two parts gritty mix). The only thing left to do was to chop off that eye-sore of a top. Remember that when you cut, do so with a sterilized cutter and do it diagonally. It exposes more surface, to be sure, but as the plant grows, the diagonal cut is easier to grow over. For plants that are outside, this diagonal cut has the advantage of preventing water from beading on the surface so that it dries faster. Some growers would use various sealants from nail polish to wood glue. Or you can also sprinkle ceylon cinnamon on the cut--it is a mild fungicide. After being pruned, this seedling went back to the PPU, although this time, it will also get some nice heat. Normal care was resumed --- water every week and even some dilute fertilizer once in a while. With temperatures in the PPU at around 30C during the day and about 22C at night, it took only a week for new, healthy leaves to grow back. Within weeks, the seedling was unrecognizable. Pruning the top has changed its entire concept completely. Sometimes, a pruned branch will grow two or more new branches around the cut. Sometimes, only one. But when you prune, keep an eye on both of these possibilities because pruning has the potential to dramatically change the way your plant looks. 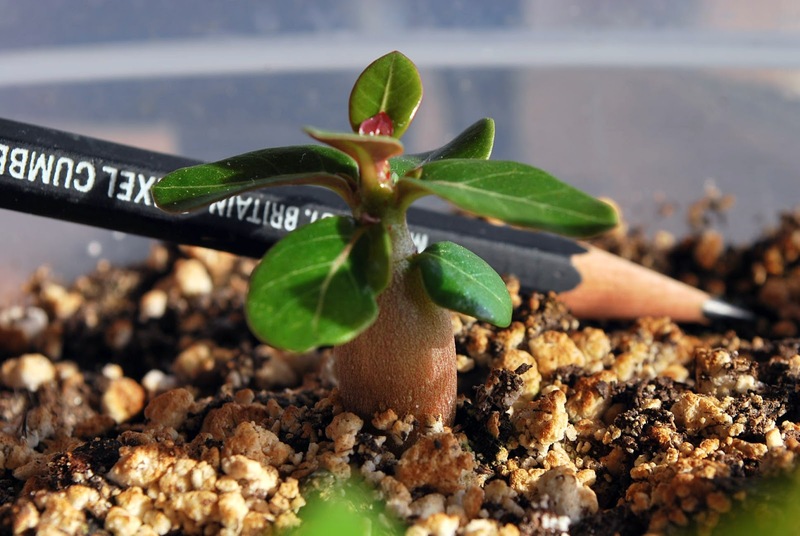 Within a month, there was little evidence that the seedling was ever pruned and actually lost more than an inch of its top portion. It has also started developing a slightly rounder caudex. It definitely looks much better. After only one month, the seedling has recovered fully. 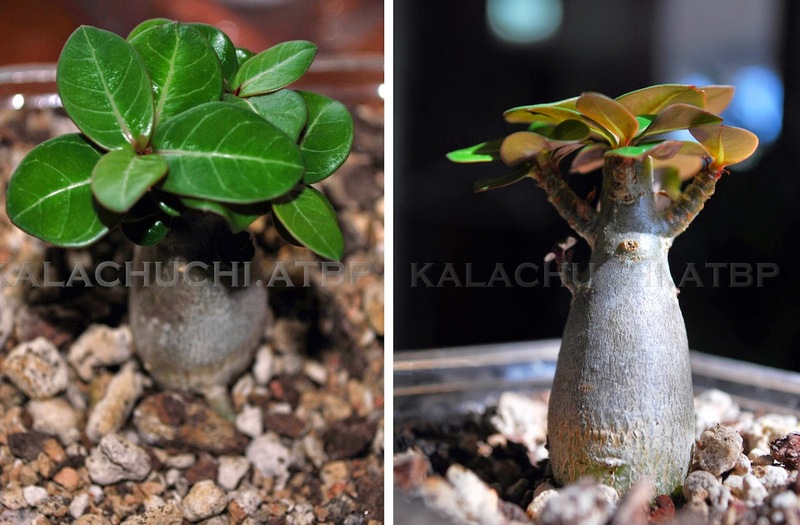 Part VI Adenium Seedlings One Year Later.. I was wondering when and how I could prune my seedlings. I appreciate the entertaining knack you have of sharing your information about these beautiful plants. I referenced your site frequently as I was sowing my seedlings. I enjoy checking back for updates. Thank you! You created a beautiful shape - I never would have thought to do that or had the nerve. Now I can't wait. I'm thinking of pruning mine but not sure if I should do it now or wait for next year (please check my blog for pics if you like :) ). I don't use artificial light and the weather is still summerly sunny. If the new growth comes after a week or two it should be fine, I thought. Any advise? Hmm...tricky timing. If you are getting night temperatures above 18C and daytime temperatures above 25C, I think you can still prune. Adeniums recover quickly but should temperatures suddenly drop, they will be slower bouncing back. It also matters how old or established your plant is--they younger they are, the faster they react to various trauma (i.e. pruning, repotting, accidental falls, etc). this makes it easier to remedy their problems. Older plants are hardier, in my experience but when they do become problematic, they are slower to show signs of serious trouble and so by the time you notice, the problem has already worsened. Finally, how drastically do you intend to prune? having said all these--I have pruned an adult plant in January! It did not go dormant and retained its leaves indoors but then it became infested with mealy bugs. Having no patience for such nonsense, I just sliced the tips off and the plant went dormant for the rest of the winter. It grew explosively this summer and even bloomed. I was actually about to post about this very plant! Addendum: I just checked out your blog. You have to help save my Aloinopsis schooneesii! It is a royal pain in the derriere. Looking forward to you pruning success post! What's wrong with your Aloinopsis schooneesii? If you water but it doesn't grow or react to it anyhow first step is digging it up and checking for mealy bugs. This is the most common cause of troubles :D After washing and repotting it will be fine.